Hi Everyone, I'd like to start by saying that we've created an improved version of KetoDiet Buddy where we've fine-tuned the calculations and have options for those who want to: lose weight, maintain weight or gain weight (muscles). We also added more tips on how to estimate your body fat percentage. And there is something else: KetoDiet Buddy will soon be included in the KetoDiet App! 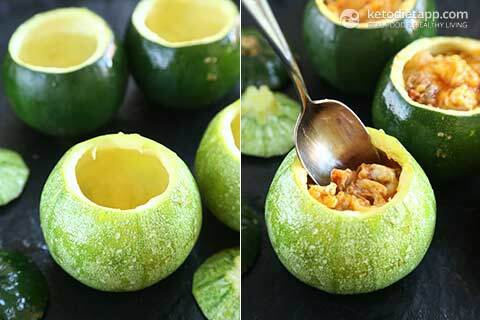 Now back to my recipe... Just like pattypan squash, gem squash or round zucchini are perfect for stuffing! 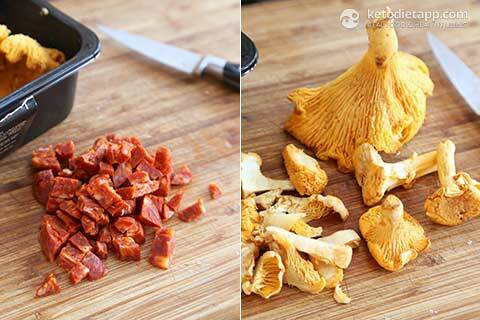 This one is made with Spanish chorizo, wild mushrooms and cheddar cheese. If you don't have Spanish chorizo, use salami or Mexican chorizo. Wondering what's the difference between Spanish and Mexican chorizo? Mexican chorizo is spicy ground meat sausage. It's mostly sold fresh and uncooked, loose or in a casing. You can use Mexican chorizo in this recipe if you like - just mix it with the ground meat and make more meatballs. Spanish chorizo is dried, cured sausage in a casing - like salami. Spanish chorizo is usually more expensive than Mexican chorizo and has a stronger taste (could be sweet, mild or spicy). Preheat the oven to 175 °C/ 350 °F. Start by preparing the zucchini. Cut the tops off. 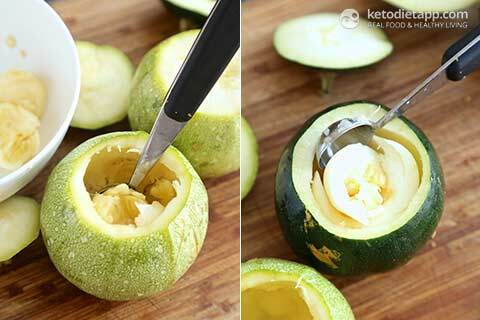 Scoop the flesh out using a mellon baller or a spoon leaving a shell about 1/2 inch (1 cm) thick. Place the scooped flesh into a bowl and set aside. Brush the squash and tops with about a tablespoon of melted ghee. Place on a baking sheet and transfer into the oven for 15-20 minutes or until fork-tender. 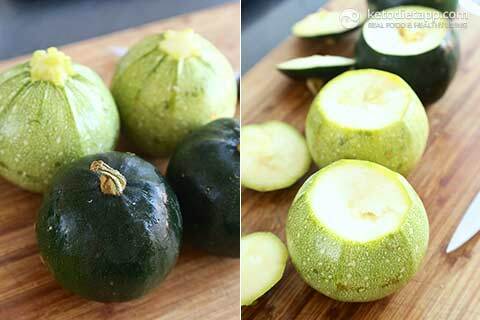 Gem squash and squash with a thicker peel will take longer to cook than round zucchini. 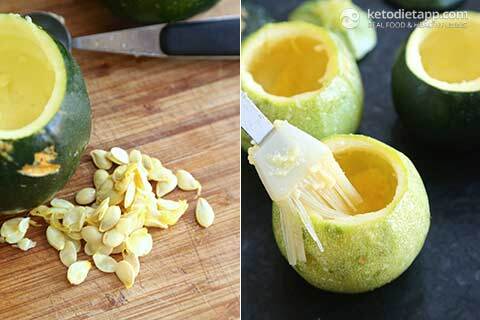 Remove any large seeds from the squash flesh - soft seeds are fine. You can use them for snacking and roast them just like pumpkin seeds. 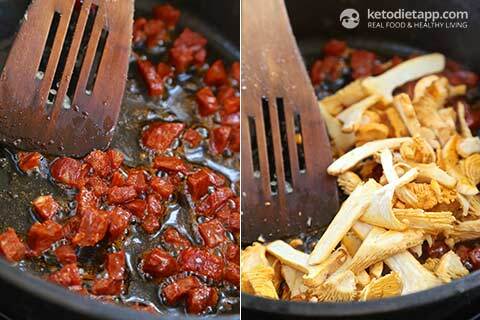 Dice the chorizo and slice the mushrooms. If you don't have Spanish chorizo, you can use salami or Mexican chorizo too. 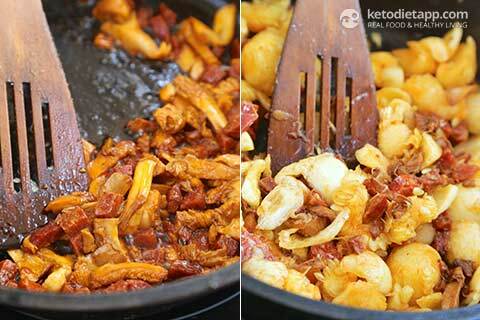 Place the chorizo in a hot pan greased with the remaining ghee and cook over a medium-high heat until crisped up, for about 5 minutes. Add the mushrooms and cook for 3-5 more minutes while stirring. 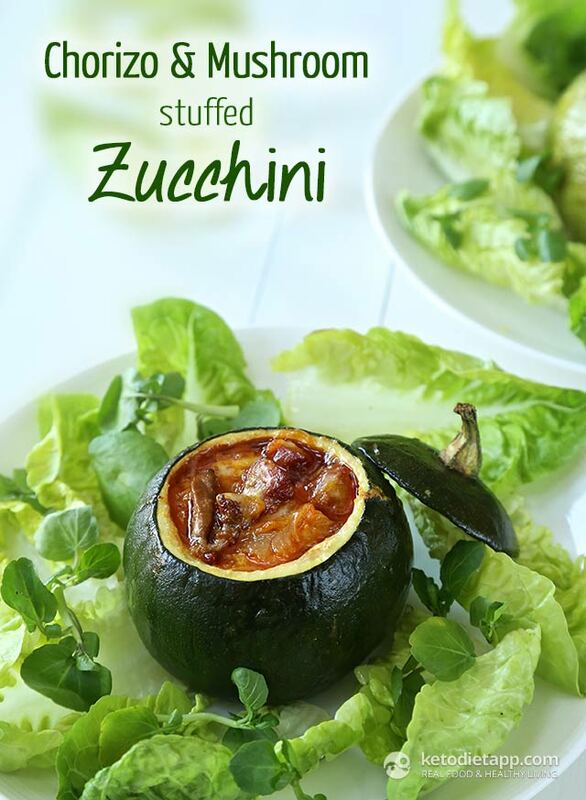 Then add the zucchini flesh and cook for another 3-5 minutes. Once cooked, set aside. 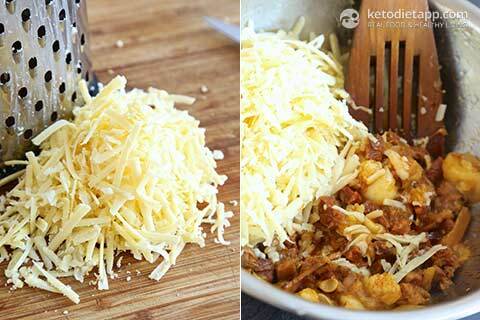 Grate the cheddar cheese and add to the cooked chorizo & mushrooms. Mix until well combined. Add to the pan with cooked zucchini. Season with salt and pepper to taste and mix. 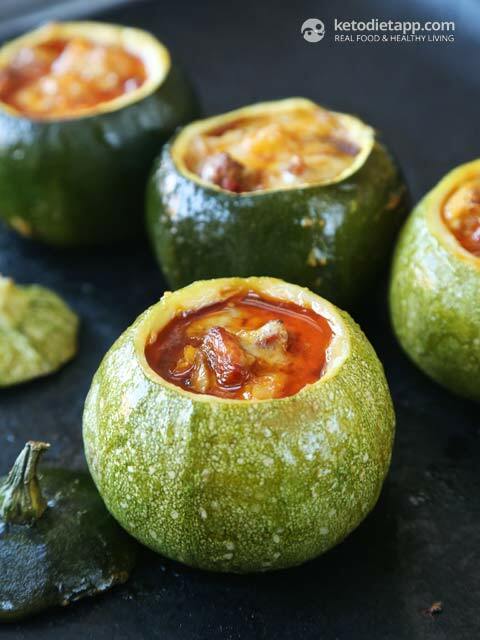 Spoon the cooked squash, chorizo, mushroom and cheddar mixture into each of the zucchini shells. Cook for 15-20 minutes. Enjoy with a side of crispy greens!